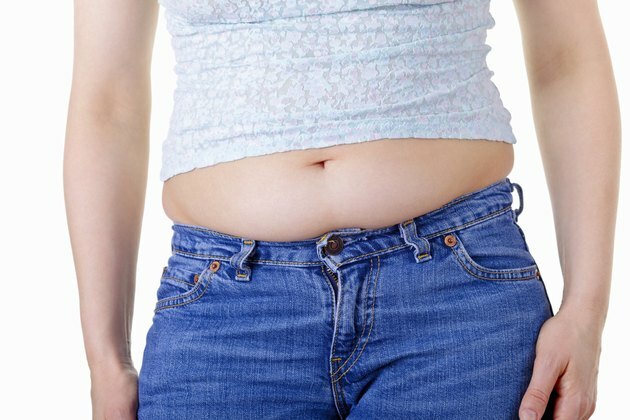 Call it your "muffin top," "middle-age spread," "jelly rolls" or "apron," but there's nothing harmless about belly fat. Excessive belly fat puts you at a high risk of developing chronic disease. Men with a waist larger than 37 inches and women with one larger than 31.5 inches should be concerned about the potential health consequences. Understanding why your belly expands can help you take measures to shrink it. Increased belly fat correlates with increased risk of metabolic syndrome, cardiovascular disease and type 2 diabetes. Women with a lot of belly fat are more likely to develop breast cancer or need gallbladder surgery. Subcutaneous fat, which lies just below the skin and usually is found at the hips and thighs, doesn't act metabolically like visceral fat does. The deep-lying belly fat surrounds internal organs and releases inflammatory compounds that negatively affect your system. In men, testosterone drives the development of belly fat. Even in a man's youth, he's putting down visceral fat cells, but high levels of testosterone often keep them from expanding. As he ages and testosterone naturally decreases, these fat cells expand, and his belly grows. In women, fat is usually concentrated in the hips, thighs and buttocks to support childbirth and breastfeeding. But as she ages and estrogen production decreases, much of that fat redistributes to the belly, forming visceral fat. Belly fat can accumulate at any age, though, especially if you make poor dietary choices. Too many calories from anything can cause your middle to expand. Too much saturated fat, found in full-fat dairy and fatty cuts of meat, and trans fats, found in some processed foods, can contribute to visceral fat development. A diet heavy in refined sugar and grains often correlates with a larger waist size. A study published in a 2009 issue of the Journal of Clinical Investigation found that people who consumed fructose-sweetened soft drinks were more likely to have visceral belly fat. Even diet soda drinkers could be at risk. A study published in a 2015 issue of the Journal of the American Geriatrics Society detected an association between consuming diet soda daily and increased abdominal girth. Refined grains, such as white bread and pasta, can also contribute to belly fat. A study in a 2010 issue of the American Journal of Clinical Nutrition showed a correlation between increased refined grain intake and the development of belly fat. Choose whole grains, such as brown rice or barley, instead, to help keep your visceral fat growth at bay. According to the Rush University Medical Center, a lack of physical activity encourages the buildup of belly fat. Be more active regularly, by choosing the stairs over the elevator or parking farther out in the lot, but also by consciously exercising most days. The Centers for Disease Control and Prevention recommends you exercise at least 150 minutes per week at a moderate intensity. Increase that level of exercise to experience more benefits, which include reduced accumulation of belly fat and disease risk. Getting too little or too much sleep, less than 5 hours or more than 8 hours per night, also correlates with extra belly fat. Being under too much stress, whether it's from bills or strict work deadlines, causes your body to pump out more of the hormone cortisol. Cortisol has an effect on where you store your fat and, in many people, it leads to the development of visceral fat. What Causes Men to Have Hard, Fat Bellies? What Causes Middle Aged Men to Gain a Lot of Weight?